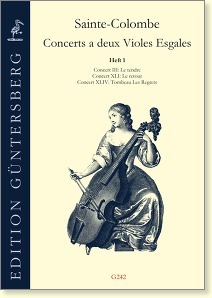 Sainte-Colombe’s “Concerts a deux Violes Esgales” were published by Paul Hooreman in a scholarly edition in 1973. 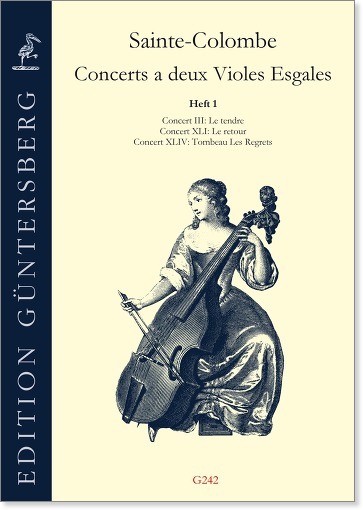 Edition Güntersberg has taken upon itself the task of publishing separate editions of some of the sixty-seven concerts in a practical edition. The first volume contains the three concerts that are performed in the movie “Tous les matins du monde” (“All the Mornings of the World”), and in that way have become known to a wider audience. The second volume contains three concerts in D minor which are not widely known. The third volume contains two consecutive concerts that are somewhat longer longer than most of the others. Sainte-Colombe’s music is so interesting for the performer because it violates many compositional and musical rules, and as a result often seems improvised. Its soothing and frequently melancholy character is unique. It represents a challenge that every viola da gambist should take upon him/herself. G242, page 5: The introduction has been extended. It now contains the translation of the index entries, see here.